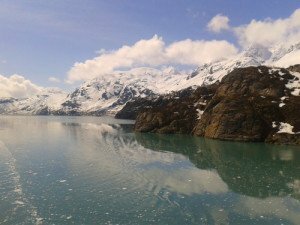 Our Glacier Bay cruise guide gives you information about what you will see and experience during your day cruising in Glacier Bay. 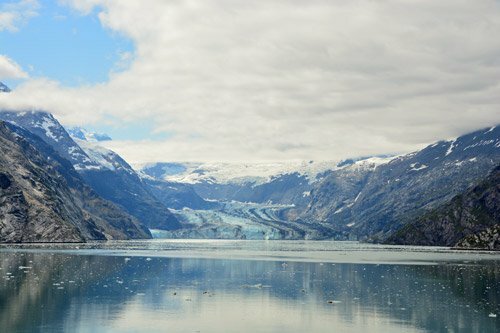 When cruising Alaska there is a large chance your ship will spend a full day cruising through Glacier Bay National Park. 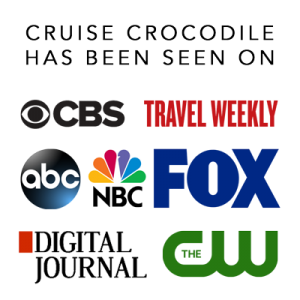 Therefore Cruise Crocodile will not offer the regular port guide in this case, but a special guide for Glacier Bay. What do you want and need to know about your day in this gorgeous National Park. Glacier Bay is the second largest protected area in the world, the first being Antartica. It protects and preserves nearly 600.000 acres / 2428 km2. This national park is a piece of unwrapped nature that will touch anyone who will witness it. 250 years ago Glacier Bay was a one gigantic glacier that was over a 100 miles long. It was fed by several glaciers and ice fields that were formed over the course of hundreds of years. It was a moving river of ice that carved itself through the landscape destroying anything that came in its path. Now 250 years later that glacier has retreated. All that remains is a bay that is now filled by seawater where we can still find over about a 1000 smaller glaciers. Most of these are hanging glaciers that you will spot on the mountain peaks. 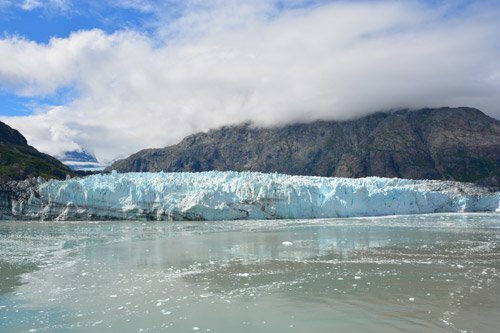 Glacier Bay also has 11 tide water glaciers of which you will be able to see at least 4 during your day in Glacier Bay. These are without doubt the most spectacular ones you will see. The most enchanting thing about this piece of unwrapped paradise is the sheer size of the glaciers that remain and the facts that this bay is living proof of ecological succession. Although the glacier destroyed everything in its way, nature finds a way and life returns. Any cruise ship going to Glacier Bay will get some special assistance on board. In the early morning several Park Rangers will board your vessel. They usually give presentations and commentary throughout the day and are available for any kind of questions you’d might have about the park. Their service is absolutely wonderful and we highly suggest you utilise the these knowledgeable rangers to get a better understanding of this unique spot on earth. The map underneath will show you a map of Glacier Bay with several points of interest along the way. 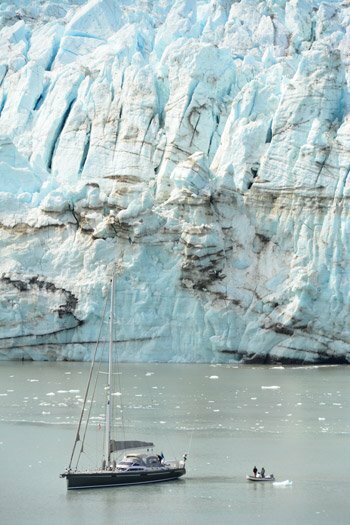 Please know the average time ships spend in Glacier Bay is about 8 to 10 hours. Cruise ships take another route every time, so keep track of where your ship is in the bay. A: Ranger station: Glacier Bay Lodge. This is where the Glacier Bay Rangers will get on a small boat. This boat will meet the ship at the middle of the bay. They match up speed and From here it is 55 miles from the tide water glaciers. B: Humpback whales area. 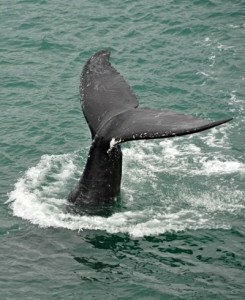 It is estimated that there are about one thousands Humpback whales South East Alaska. There are specific areas where they are usually spotted. One is near the entrance of Glacier Bay. This is definitely a spot to keep an eye out for them. C. South Marble island. This is the island known for its residents: sea lions. They have made this tiny island their habitat. They usually chill out on the rocks, enjoying some sun and maybe get up every once in a while to feed. The best way to spot them is to go to the outside deck. There is a large change your nose will point you into their direction. D. Lamplugh glacier. This is a 8 mile / 13 km long glaciers in Glacier Bay. It was named after geologist George William Lamplight, who visited Glacier Bay in 1884. E. John Hopkins. 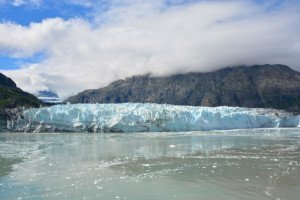 The bay where you find the John Hopkins glacier is usually not accessible for cruise ships. This is because there are about one thousand harbor seals that use these bays to nurse their young once. They find an ice berg to have their young safe from danger. Usually you are able to look into the bay, but your ship will not sail into it. F. Russel island. This is an island known for its bear population. Keep your binoculars at hand, because you might be able to spot them on the shoreline. G. Margerie Glacier. Margerie is the jewel of Glacier Bay. It is a glacier of about 1 mile wide, 20 miles long and about twice as high as your ship. H. Grand Pacific. When the captain of George Vancouver’s expedition ship found Glacier Bay in late 18th century he described it as one gigantic wall of ice. This was the Grand Pacific glacier he was talking about. Just over 200 years ago this might have been one of the largest glaciers in the world. Nowadays it would even be hard to recognise it as a glacier. It has retreated almost 70 miles, leaving a valley now filled by sea water that we now know as Glacier Bay. The ice of the Grand Pacific glacier is now covered by 3 feet of gravel and stones. The glacier is not active, there is no ice field or other glacier to feed it anymore. Spot wildlife In Glacier Bay there are a lot of animals that roam around. Over 40 different species have been recorded in the park. A park ranger on the bridge will usually notify you over the PA system when wildlife is spotted. Amongst the most spotted animals are: mountain goats, grizzly bears, black bears, sitka black-tailed deer, lynx, marmots, beaver and red fox. Spot marine life There are over 160 marine and estuarine fish species in Glacier Bay. The most notable among them are: orca and humpback whales. They are often spotted in the south of the bay. Other whales that have been seen in Glacier Bay are grey, minke and fin whales. Harbor seals are often spotted at John Hopkins glacier. They usually lie on the icebergs floating around in front of John Hopkins Glacier. Stellar Sea Lions are often lying on the stones of South Marble island. 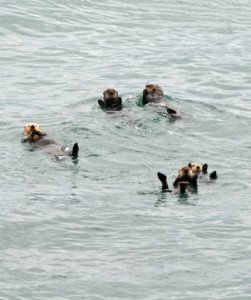 Other than that you have a change to spot Northern fur seals, sea otters, harbor porpoises and Dall’s porpoises throughout the day. Bird watching Glacier Bay is home to over 240 bird species. Be on the watch for bald eagle, golden eagle, raven, norther hawk owl, murre, cormorant puffin, pigeon guillemot, blue grouse and gulls. Will we see the glaciers calving? Cruise ships usually visit Margerie glacier for an hour before continuing on. The glaciers are calving every day, but you never know if calving will happen during the hours you are there. Isn’t the correct geological term for Glacier Bay a fjord? Yes, it is. What is a fjord? It is a U shaped valley, carved out by a glacier, now filled by sea water. 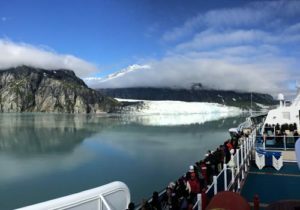 What should I bring to Glacier Bay? This information and binoculars! More information will be given on board. 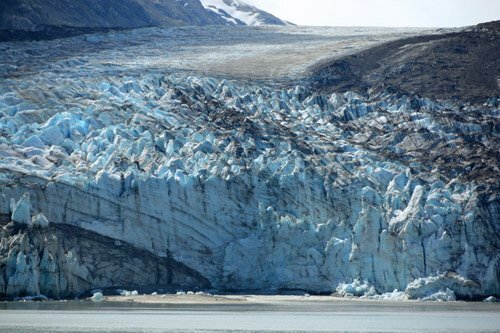 How old is the ice calving off the face of the glacier? The ice falling off the face of the glacier is about 200 years old. How big is Glacier Bay National Park? It is 3.3 million acres large. How high is the highest mountain? Mount Fair-weather with 15300 ft or 4669 m. It’s summit marks the US / Canadian border. Why doesn’t the Grand Pacific look like a glacier? That is because the source of the glacier is not to weak to feed it with new ice. Why does the ice appear to be blue? It appears to be blue because it light is reflected differently in firn that in other types of ice. Firn is a type of ice that occurs when the ice is under so much pressure that even oxygen is being pushed out of it.